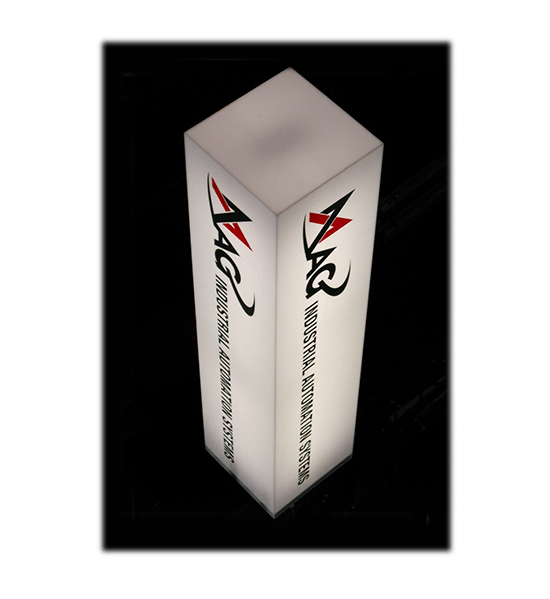 Large luminaries for trade shows. Trade show displays are always a special test of ingenuity. The challenge boils down to scheduling and budgeting a one-of-a-kind display solution with a carved in stone completion deadline. Unfortunately, estimating and scheduling innovation is difficult. This customer makes large and complex trade show displays. (Think Auto Show scale displays.) Their client wanted to hang lighted signs 30 feet above their booth with translucent vinyl graphics on all four sides. The luminaries were 8 feet tall and 2 feet wide. Recalling the “Sword of Damocles” story from Greek mythology, we were determined to build these displays so they would travel intact and stay in place when hoisted to the rafters. We hid a lot of reinforcing structure near the top so that the strength did not interfere with the aesthetics of the graphics. The displays functioned as designed and were used at many trade shows around North America for many years.